Financing available through Toyota Financial Services (TFS) OAC. Special low rate finance offer of 0% available for terms up to 36 months on 2019 model year Corolla. Finance example of 0% over 36 months for $10,000 equals $278 per month with a cost of borrowing on $0 and a total obligation of $10,000. Toyota Cash Incentive of $4,000.00 available on 2019 model year Tundra’s (excluding TRD Pro model) may not be combined with Special Low rate finance offers. All Toyota Cash Incentive are applied after taxes have been calculated on the negotiated price. 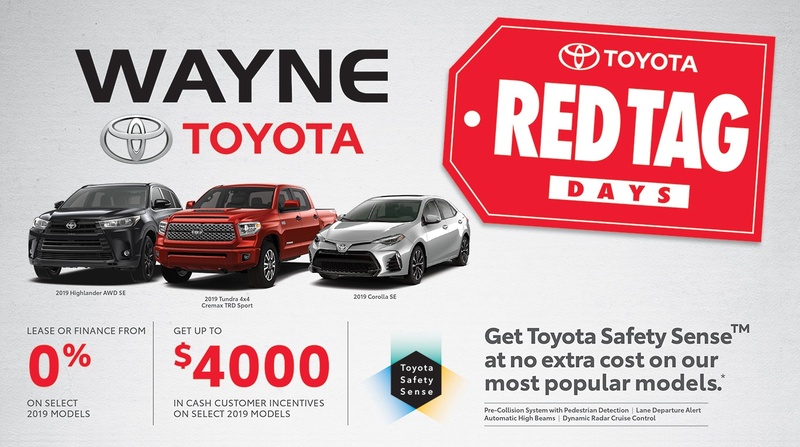 Special low rate finance offers and Toyota Cash Incentives are available to retail customers (excluding fleet). Customer must take delivery by April 30,2019.